The city of Piraeus is the main gateway from Athens to the islands of the Aegean, located 12 km southwest of the Athens city center and lying along the east coast of the Saronic Gulf. It is the largest port in Greece and the busiest port in Europe in terms of passengers, serving around 20 million people per year. In this article, you may find more info about Piraeus. The port of Rafina is the main gateway from Athens to the islands of Mykonos, Tinos, and Andros. Rafina is located 30km away from Athens city centre, on the north-eastern side of Attica. Rafina is the second largest passenger port of Athens, serving millions of tourists that visit the Greek Islands. In this article, you may find more info about Rafina. The port of Lavrion is the main gateway from Athens to the islands of Kea (Tzia) and Kythnos. Lavrion is located 30km away from Athens city centre, on the north-eastern seaside of Attica. Lavrion is the third largest passenger port of Athens, serving the quite busy ferry routes to Kea and Kythnos. In this article, you may find more info about Lavrion. Athens is connected to Crete mainly through the port of Piraeus, but there is also a seasonal ferry from Rafina to Crete. Two or three ferries per day depart from Piraeus to Heraklion and Chania all year round, while during summer there may be a fourth one. You can find information on these famous ferry routes: from Athens to Heraklion and from Heraklion to Athens. Athens is connected to the islands of the Saronic Gulf through the port of Piraeus. The ferries that connect Athens to the islands of the Saronic Gulf are usually highspeed ferries to Hydra, Spetses, and Poros. The ferries from Athens to Aegina and Agistri may be either conventional or highspeed. Here you may find all the ferry itineraries and more info on the trip duration for ferry routes from Athens to Aegina and from Athens to Hydra. 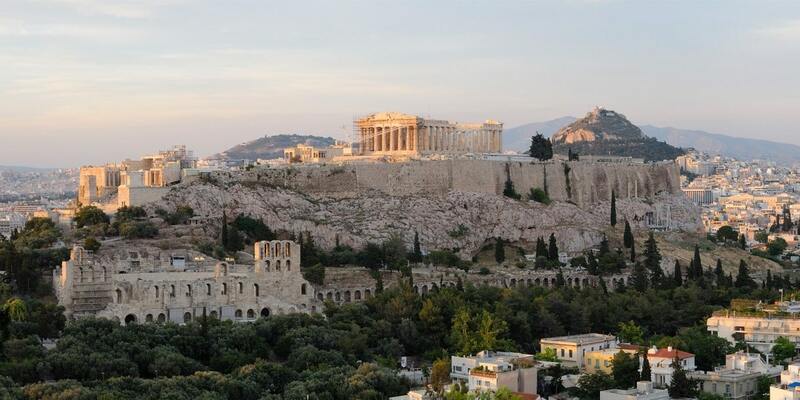 Athens is connected to the islands of the Cyclades through all the three aforementioned ports i.e. Piraeus, Rafina, and Lavrion. Below, there is a rough explanation of the ports that serve the most popular of the Greek islands. Τhese islands are served mainly by the port of Rafina and secondarily by the port of Piraeus. The ferry route from Rafina to Andros, Tinos, and Mykonos, is operated on a daily basis during the whole year. The high-speed ferry needs only 2:30 hours to reach Mykonos from Rafina, while the conventional ferries need ~4:30 hours. There is also at least one daily ferry from Piraeus to Mykonos that usually passes by Tinos and Andros. If you would like to see all the itineraries from Athens to Mykonos, Tinos, and Andros, you can select Athens (all ports) in Ferryhopper and all available trips will be presented to you! More details on these ferry routes you can find at our articles Ferry from Athens to Mykonos, to Tinos and to Andros. The popular Greek islands of Santorini, Paros, and Naxos are served by the ports of Piraeus and Rafina. The main port for this route is Piraeus, where most of the conventional ferries depart for Naxos, Paros, and Santorini. On the other hand, Rafina may be more convenient for you as there are also high-speed ferries departing from Rafina to Paros, Naxos, and Santorini. However, this is a seasonal ferry connection that operates during the summer period (April or May to October). For these famous ferry routes you can find details at our articles Ferry from Athens to Santorini and to Paros. Ferries that connect Athens to Milos, Sifnos, and Serifos usually depart from the port of Piraeus. During summer there are several ferries that serve this route, while during winter these may be a bit less frequent. The ferries that connect Athens to Rhodes, Kos, Kalymnos, Patmos and the rest of the Dodecanese (Karpathos, Nisyros, Leros, Tilos, etc) depart from the port of Piraeus. As these trips are quite long, it is highly advised to book a cabin for you and your co-travelers. Saving time and getting relaxed is always good when you are on vacation! The ferries that connect Athens to the islands of Chios, Lesvos (Myitilene), Samos, and Ikaria depart from the port of Piraeus. Keep in mind that some of these ferry itineraries also pass-by smaller islands of the Northern Aegean Sea. Visiting Fournoi, Psarra or Oinousses may be a great idea to try a genuine taste of Greece and enjoy off-the-beaten-track vacations. As the ferry trips from Athens to Lesvos, Chios, and Samos are also quite long, we again advise you to book a cabin for you and your co-travellers.